Although the Empire has purged the Jedi, not all who use the Force have been hunted down and killed. In the hidden corners of the galaxy, those who can touch the Force remain hidden, hunted, and outcast... but alive. 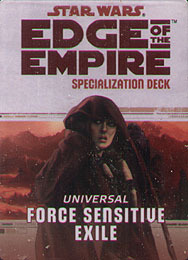 This deck requires the Edge of the Empire Core Rulebook and includes cards for all 20 talents available in the Force Sensitive Exile specialization.